Even if the Golden State Warriors had lost the 2015 NBA Finals, this year in NBA history has given us some undisputed truth that doesn’t lie in some catechism or Barkley-esque saying. 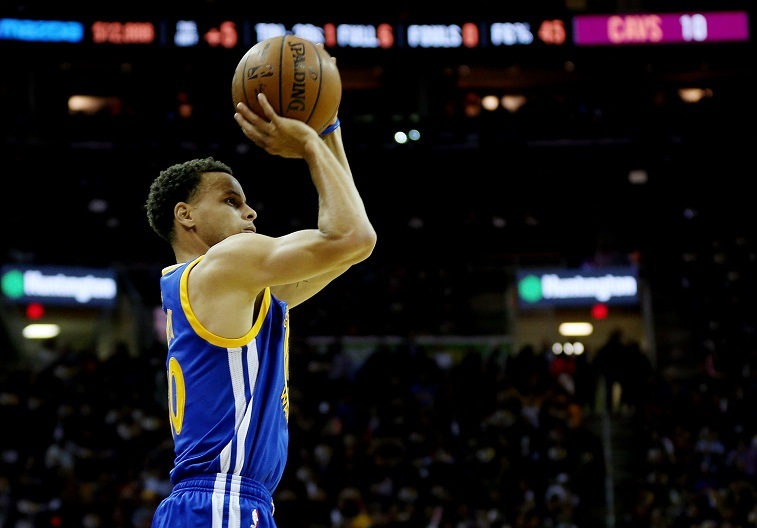 The three-point shot is here, and it isn’t going away any time soon. This is not particularly new, but the legitimacy of the deep ball and the frequency that teams are stepping toward it has only really come to fruition over the 2014-2015 NBA season. Consider: Since the rule was adopted in time for the start of the 1979 season — it had existed in the ABA since 1967, and was there in 1961 during the lone season of the ABL — a nearly unbroken increase in frequency and rate has been seen across the league. In 1980, the entire NBA averaged just two (as in a pair of attempts) of three pointers per game. Coaching staffs, like your grandparents or big businesses, are resistant to change, and it wouldn’t be until the ’94-’95 season that the league would break into double digits — they came close in the ’93 season, with 9.9 per game across the board — 15 years after the line was first painted onto professional hardcourt, aided and abbetted by a shortened three point line experiment that was discarded after three seasons. Nothing happens in a vaccum, of course, and the suddenly three-happy NBA was undeterred by the reversion. See, players and coaches now had time to catch up, to learn the shot. That, combined with rule changes that discouraged post play and opened up the floor for drive-and-kick play actions, set the stage for letting it fly. Steph Curry, in other words, is standing on the shoulders of giants, and we’re not talking about Andrew Bogut and Festus Ezeli. He’s on pace to crush every record related to the shot, sure, but he’s also the byproduct of his era. 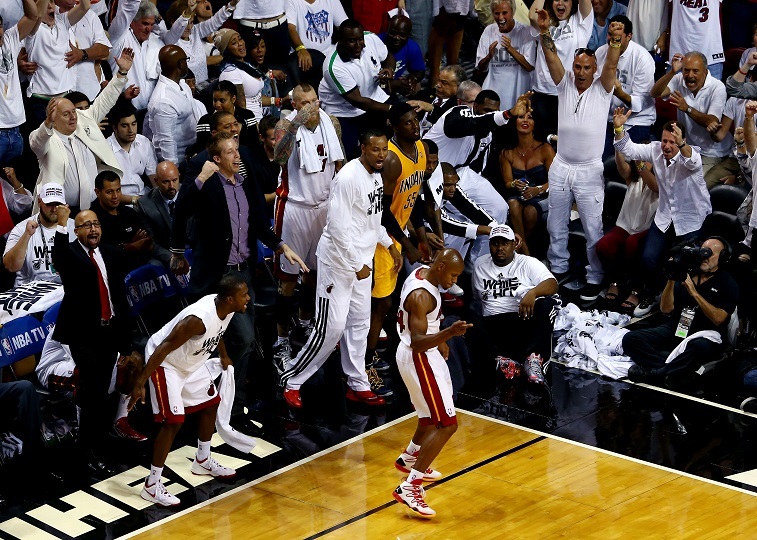 Let’s examine how things are different today than they were in the days of Larry Bird or Ray Allen. This season, Curry averaged just over eight three attempts per game, and he nearly hit that mark last year, as well. This puts him on a very small list of players who have ever done that: Ray Allen, Baron Davis, Quentin Richardson, Antoine Walker, George McCloud (who? ), and Michael Adams (who again?). Of those players, Allen stands head and shoulders above the rest if you were to pick one player as the “best” shooter of the bunch and couldn’t pick Golden State’s MVP. You’ll notice, though, that Ray-Ray only started shooting that many threes in his 30’s, making him an anomaly here. Richardson was a member of the Seven Seconds or Less Phoenix Suns, a prototypical team of modern legend that set the template for the heavy pick and roll offenses we see employed by every team in today’s game. Walker was on a Celtics team that tried to gun their way to wins, and was moderately successful during a weak Eastern Conference. Adams, though, actually lead the league in three pointers attempted over four consecutive seasons, starting in ’87-’88 and ending in ’90-’91. The fact that you’ve probably never heard of him before indicates just how much the scales have shifted. The intentionality of jacking threes (we’re not too fond of the phrasing, since it implies a carelessness that doesn’t always fit) changes: the 7SoL Suns were looking for the fastest shoot available, and that shot was often found beyond the arc, while Davis and Walker were simply trying to bury opponents with volume, and neither of those teams would take advantage of the mathematical innovations that allowed, say, the Houston Rockets to ignore the two point shot, but the results speak for themselves: a three point shot taken by an average — this seasons’ average from deep was 35% — shooter is superior to a two point shot that isn’t a layup or a dunk, because shooting a three at 33% accuracy yields the same number of points as shooting 50% from two. So how does the state of the three look after the 2014-2015 regular season and nearly almost all of the playoffs? Perhaps no one is more emblematic of the shift in this new way of basketball thinking than James Harden, the best shooting guard in the game today. As you can see from his shot chart, Harden and the Rockets as a whole have eschewed the long two almost entirely, focusing their offensive output on three pointers and shots taken at the rim (this doesn’t count any attempt that resulted in a foul, either). 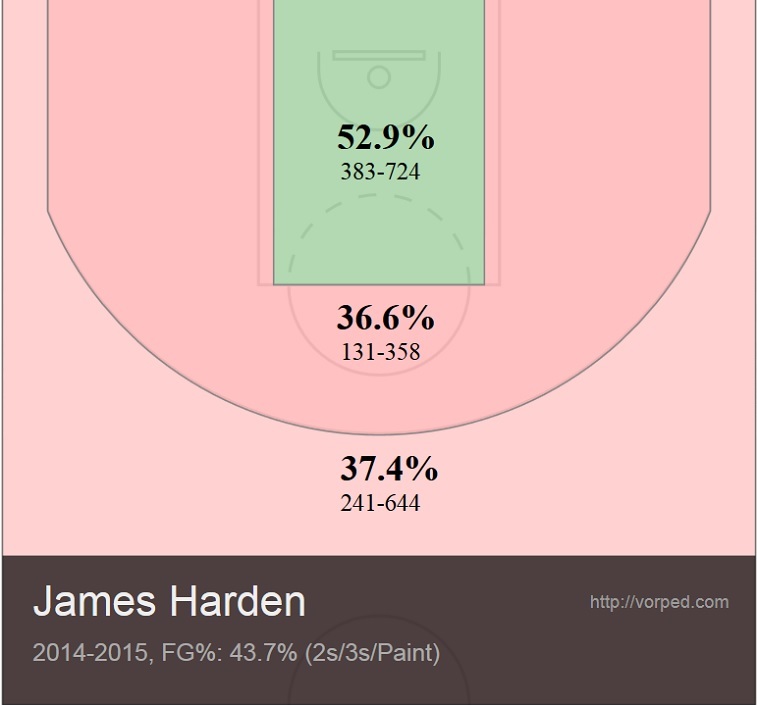 Harden is many things, and while you can make fun of his defense one thing you can’t call him is a bad shooter from anywhere on the floor. Considering that his percentages are nearly identical from long-two range as they are from three — and keeping in mind that these are shots made with NBA defenders who are actively trying to prevent him from scoring the basketball — the three is significantly more valuable, as it is worth one-and-a-half the number of points than its 18-foot counterpart. With NBA teams averaging over 22 threes a game, there’s no going back to the “good old days” of the midrange shot. This is kind of a bummer aesthetically, because it means that the fadeaway two over an outstretched defender (the best looking shot in basketball) could become a rare commodity — think of how hard it is to find “real” post play nowadays — but consider the Cavaliers in the 2015 Finals: they’ve found a way to defend the three. NBA defenses aren’t stupid, and as teams rely more and more on beyond the arc shooting, perimeter defense is going to become more of a valued commodity than it is currently. The evolution of hoops is a constant thing, and we’re excited to see where it goes next.